For a student, dining at Mosaic might be a tug on our budget. Mosaic has been on the talk of the town list of Urbanspoon for the longest time and I have always wanted to try them out. I got my chance when Vaneats.Ca teamed up with Chef Thomas Heinrich offering a dining pass for CAD27 for Mosaic’s Harvest menu featuring selected seasonal produce and fresh ingredients. The 3 course dining menu features three appetizers, three main courses, and two desserts. Everything about Mosaic was wonderful and A-class. My friend, Nathania and I got a table right next to their tall windows with the view of Burrard Street. In addition to the city view, the service was impeccable and I also got to meet Chef Heinrich in person. I appreciate how both Chef Heinrich and Jo would come out and ask us how the food was and if we were enjoying ourselves. How often do you get to experience that? Your opinion matters! Starting off my Autumn culinary journey, I had the “A la Minute Smoked Skuna Bay Salmon” with a kale nori salad and aromatic wasabi cauliflower puree. I’ve always been very careful with wasabi as everyone might have experienced the spiking hot sensation leaving you in tears. 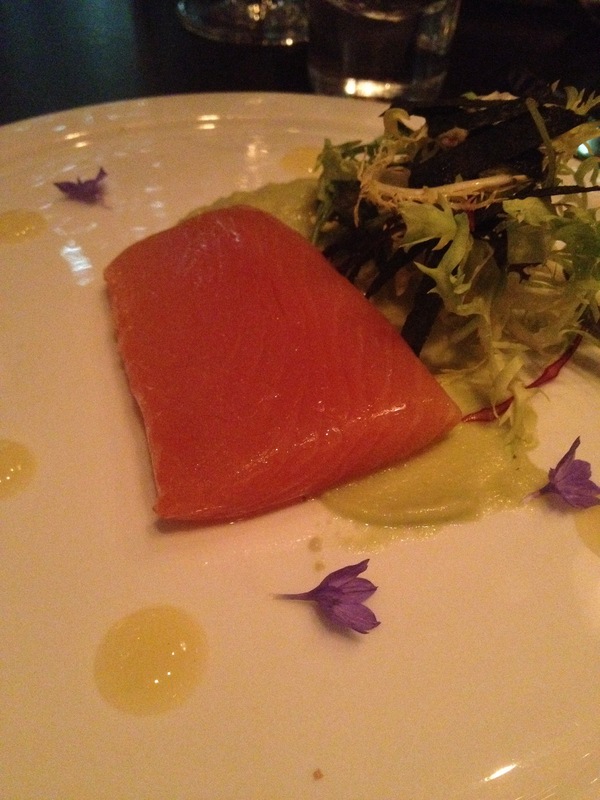 Contrary to what I thought wasabi would be, the puree was smooth and mild giving the smoked salmon a savoury taste. Nathania and I did not order the “Apple Lane Orchards Apples Bisque” with roasted chestnut and spiced brandy cream but Chef Heinrich decided to let us taste what else was offered, thank you! 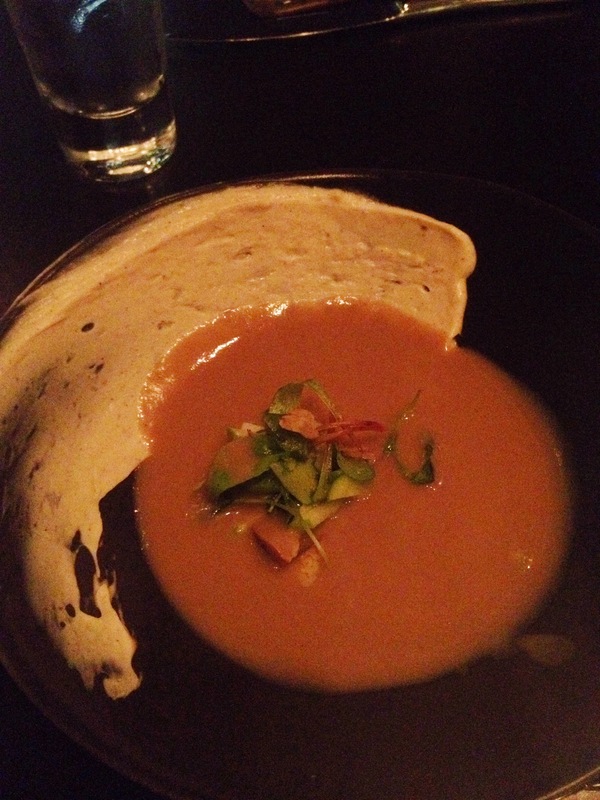 The bisque was autumn in my mouth, the apple bits were crisp with sweetness and everything about this soup defined fall. More compliments from the chef was the “Fall Salad” with baby carrots, beets, Tokyo turnips, fennel, pumpkins drizzled with tangerines dressing. 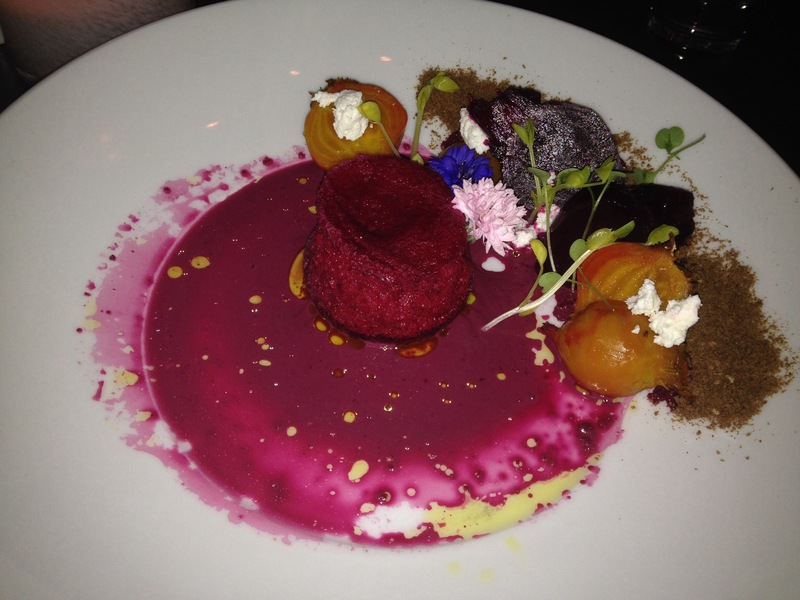 I was never persuaded to try beetroot due to the colour so this dish was a push for me. I can almost describe the beetroot foam as beetroot sorbet and a very seasonal twist compared to all the salads I have ever had. What did I like most about this? – the succulent Tokyo turnips. 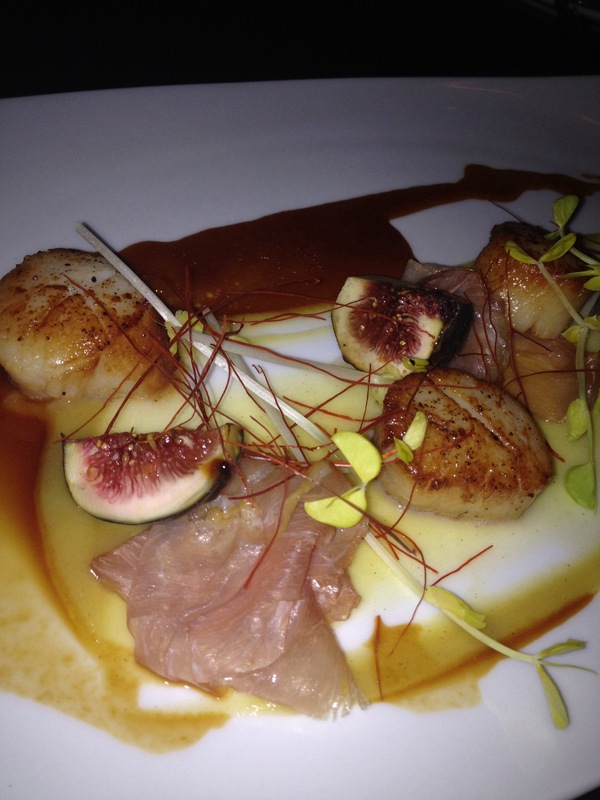 I have read other bloggers talking about how Mosaic’s scallops are always the best so I went for the “Seared Baja Ocean Wise Scallops” with sweet potato, figs and prosciutto. The scallops by itself were already exquisitely flavourful enough but with prosciutto? Now that’s a whole new level. I’m coming back for more juicy and meaty scallops! 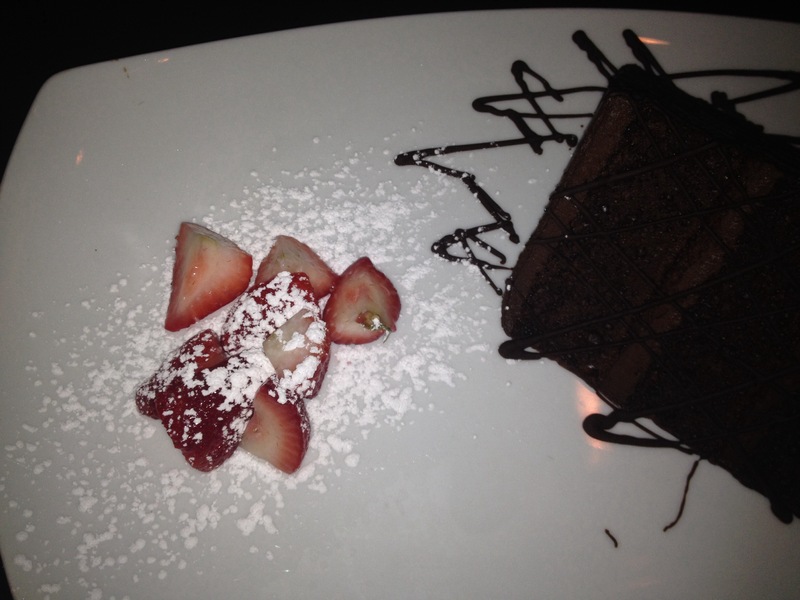 I did not expect a 4 inch tall, signature triple layer ‘piece’ of “Mosaic Chocolate Cake” when dessert came. I literally thought to myself “how can I possibly finish this?”. Every bite was rich with a creamy sensual touch of milk chocolate feeding my chocolate craving. Now this is chocolate cake.